Anuj visited Ireland during his Junior Year Spring Break at MIT and could never stop talking about that trip and the beautiful sites that he got to see there. He often shared these stories years after that trip. Here are a few glimpses of that trip he took with his fraternity brothers. With friends in front of an old Irish castle. In front of Guiness Brewery in Dublin. Anuj never took himself to seriously. Now the question is... how did he get in there in the first place?! On this day commemorating Martin Luther King Jr.'s life and his immeasurable contribution to our society, we are reminded of how he was an inspiration for Anuj as well. During his many years at St. Francis College in Lucknow, India, Anuj showcased his talents in a number of areas including debates, drama, quiz competitions, and of course, all kinds of sports. However, the area of competition in which he began his multi-year run of winning countless awards was called "public elocution". Competitors gave a prepared speech in front of a large live audience and were judged by their clarity of delivery, passion, ability to connect with the audience, and originality, among a number of other criteria. For his first attempt on stage Anuj chose MLK's famous "I Have a Dream" speech. Like they did for millions of others, King's words moved him even at that young age - Anuj was in middle school at the time. He felt that conveying MLK's passion and strength of purpose would be a worthy challenge. 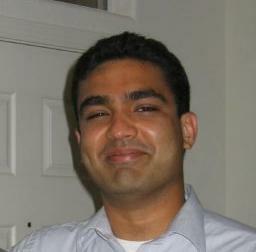 Anuj understood Martin Luther King Jr.'s deep connection to India based on the latter's lifelong public admiration of Mahatma Gandhi. Therefore he wanted to deliver the speech in a manner that was a true tribute to this great man. He not only succeeded in doing that but in the process won first prize in the contest. His entire family was so proud. We remain proud to this day because Anuj chose not only to deliver a speech by King, but decided to live his life in a manner inspired by him as well. And those who were lucky enough to cross paths with Anuj, even for a brief time, know that he unequivocally succeeded in achieving that goal. 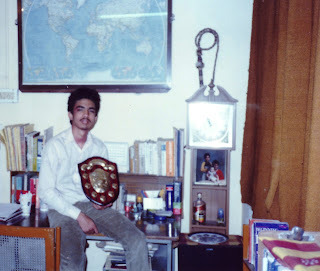 Anuj holding one of the many awards he won on stage during his time at St. Francis College. One thing Anuj had a hard time doing was keeping his eyes open in photographs. There are a lot of them with his eyes closed! Somehow he timed his blinks with the camera shutter. Big smile, eyes closed. A couple years ago. "Good afternoon. My name is Anjani Jain; I am Vice Dean at the Wharton School and would like to welcome you, on behalf of Dean Harker, our faculty, and the entire Wharton community, to this memorial for Anuj Mohan. I am especially grateful to Anuj’s family – his parents Dr. Deepa Mohan and Dr. Aditya Mohan, his two brothers Neal and Kapil, and his sister-in-law, Hema – for having traveled from California to be with us today. You will hear from Neal and from a number of Anuj’s classmates and also from Reverend Gipson, the University’s chaplain. Though an entire summer has passed since the day of that awful tragedy in California, our sense of loss is still raw and our sadness still undiminished. That Anuj was remarkably, uncommonly gifted became clear to anyone who came to be in his presence even briefly, and what really drew people to him was the grace and generosity with which he bore his talents and the genuine interest he took in the well being of others. From my vantage point, it was astonishing to see how remarkably he had bridged the gap between the two different cultural traditions of India and the United States. He thrived in each setting and his ample talents allowed him to embrace each culture as his native heritage. To honor Anuj’s claim over both cultures, I wanted to share with you a couple of verses from the Bhagavad Gita, which was composed more than two-and-a-half millennia ago and from which Indians continue to seek wisdom and solace. I will read the text first in Sanskrit, and then offer a very loose but lyrical translation by Sir Edwin Arnold from over a century ago. Both slokas are taken from Chapter 2 of the Gita. With spirit deathless, endless, infinite." Today we are reminded that we did not only lose a brother and friend in Anuj but Neal lost his best man. Countless stories come to mind of Anuj's multifaceted role during Neal and Hema's wedding. For example, in the days leading up to the event, Anuj carefully crafted a best man speech for his brother. In the hectic hours before the actual wedding and reception however, he misplaced the speech and could not find it despite some frantic searching. When the time for delivering his address actually came, Anuj did not break a sweat. He simply got up on stage and delivered an incredibly eloquent, personal, and gracious speech that was at times funny, and at others extremely moving. Amazingly, with no written notes, most of his remarks were from memory, others completely extemporaneous and none of the guests could tell until he admitted to family afterwards that he had lost his speech earlier that day! 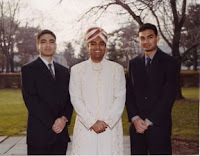 Throughout the days of festivities, Anuj played the role of an extremely happy, proud and supportive brother. Days beforehand, he helped print out hundreds of wedding programs. He also planned Neal's bachelor party in New York City which occurred the night before the wedding. When the big day came he danced ceaselessly in celebration. In fact he danced so much during the Baraat that his turban came off! In his usual selfless way, he made the day infinitely brighter, happier and richer because of his presence throughout the wedding week. Whether it was calmly carrying out a last minute errand or leading the celebration with his warm, wide smile, Anuj was there. Anuj we are forever indebted to you for making that day special for us. If an Indian wedding can be described as a stained glass mosaic of vibrant colors, then today those colors are shards of glass shattered on the floor in the deafening silence created by your absence. As with every new year, each new life is full of potential and hope. So was Anuj's when he entered this world 30 years ago. While we are devastated by the fact that so much of the incredible potential that stemmed from his brilliance and humanity will be left unfilled, we are heartened by the fact that he accomplished more in 30 years than most do in their lifetimes much longer. With Anuj's life as an inspiration, we begin the new year with intense pain but also with renewed hope. The hope that we will have the strength to carry on his mission and fulfill his desire of helping others through the Anuj Mohan Scholarship Fund. 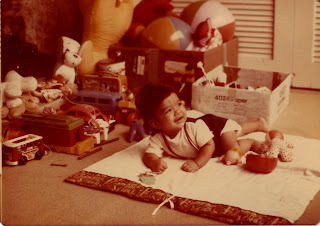 Precious baby Anuj on his patio at home in Florida. Surrounded by his toys and full of boundless potential. Winter 1977.